iSON Group, Africa’s Leading IT and Its Company bagged two awards at the 2017 Sustainability, Enterprise and Responsibility Awards (SERAs) for Best Company in Poverty Eradication and Best New Entrant in Corporate Social Responsibility (CSR). The award ceremony was held at the Shell Hall, Onikan, Lagos, Nigeria on Friday November 17th, 2017. These awards were presented to iSON Group in recognition of its robust CSR philosophy, and its progress in eradicating poverty in Africa as it drives sustainable development across the communities beyond the bands of its operation. The SERAS–CSR Awards is an annual event to celebrate organisations investing resources in the improvement of lives of stakeholders and through their social performance and investment programmes contributing to the development of Africa. This is the first edition to recognise individuals and organisations outside Nigeria. Accepting the awards on behalf of Mr. Ramesh Awtaney, the Founder and Chairman, iSON Group, were Sujeet Matwankar Head of Human Resources, iSON BPO and Bakare Adebayo, Deputy General Manager – HR, iSON BPO and Ms. Olapeju Allison, Manager –HR, iSON Technologies and Mr. Henry Erigha Deputy Sales Director, iSON Technologies. They expressed satisfaction for being part of a system that addresses the very essence of human existence. Sujeet Matwankar said, ‘’These recognitions on Responsibility awarded to iSON Group demonstrates the progress made by the organization in leading Africa’s IT and ITeS industry towards sustainable investments in human capital development whilst driving communities to achieve the global sustainable development goals’’. As part of its CSR initiatives iSON is on a mission to build capacities focused on specialized training in IT-enabled services for the youth. Its “Welfare through Empowerment” program, in partnership with the local business communities, enables growth in IT and ITeS for the African youth. Its corporate social responsibility initiatives are directed at empowering the underprivileged and the youth. According to media officer of The SERAS, Mr. Michael Ogunbanwo, “We are indeed delighted at the quality of participation thus far. Noteworthy for us is the fact that we have so many first time entrants for The SERAS this year. For us, this clearly is an indicator of the wide acceptability of the worksTruContact CSR Nigeria- initiators of the awards, in promoting and standardizing corporate social responsibility and sustainability in Nigeria and Africa’’. 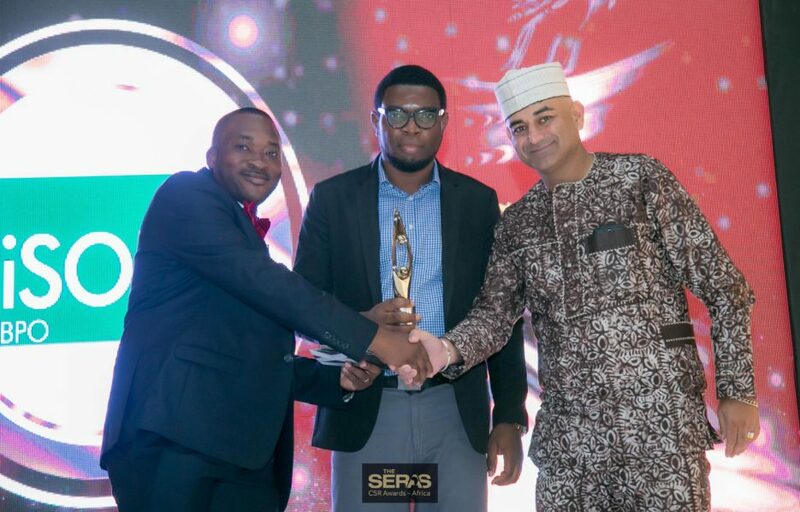 The annual SERAS CSR Awards which first held in 2007 has since grown to become the primed corporate award aimed at not only promoting but measuring corporate social responsibility and sustainability in Africa. Described as the gold standard for recognising impactful investment in CSR and sustainability the awards pulls organisations from across countries across the African continent Uganda, Kenya, South Africa, Botswana and Ghana and of course Nigeria. This edition of the awards brought recognition to brands that unravelled the links between investments/interventions and have positively impacted the communities where they conduct business and the general society at large.